The main part of this dish can be made well in advance and kept in the fridge until your guests arrive. The chicken adds a velvety, mousse-like consistency to these bites and the zesty sour cream cuts through the spiced sausage. It’s a winner. 3. Increase the oven temperature to 220°C/gas mark 7. 5. Spread about 1 tablespoon of the sausage and chicken mix onto each crispy baguette slice, ensuring it goes right to the edges of the bread. Place the crostini on a baking tray and bake in the oven for 10 to 12 minutes, then grill on the top shelf for 2 to 3 minutes. 6. Meanwhile, mix the sour cream with the lemon zest and season with salt and pepper. If you like, you could add a little lemon juice too for extra lemony flavour. 7. 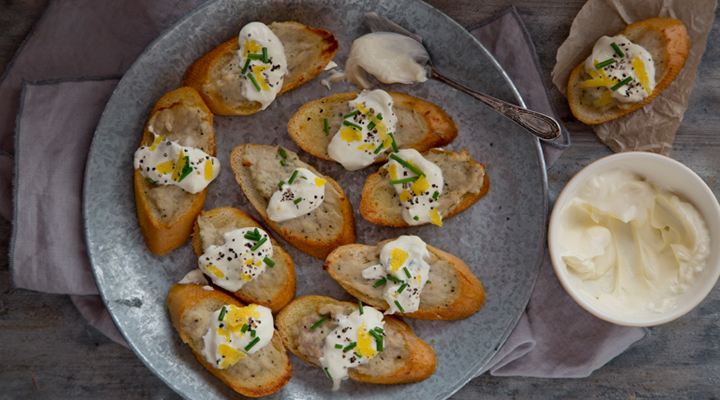 Finish the hot crostini by topping with a teaspoon of the zesty sour cream. Sprinkle with fresh chives and serve.